Sixteen years ago the premier of Victoria, Jeff Kennett, asked me to conduct an inquiry into drug policy. At the time, deaths from heroin overdoses were high and the use of cannabis and other drugs continued to mount, despite prohibition. While there has been some improvement in the management of drugs over the years, both in Victoria and nationally, fundamental problems remain. It's time to consider practical solutions to the problem. I propose a novel system whereby Australians aged 16 and over have access to a limited, regulated quantity of cannabis and ecstasy from a government-approved pharmacy supplier – provided they are willing to go on a national confidential user's register. When dispensing the substance, pharmacists would also be able to give clients advice and, where necessary, refer them for counselling or treatment. Drug-related offences also take up the lion's share of the work of police, courts and prisons. But what can we do? Some people feel that we should legalise drugs – treat them like alcohol and tobacco, as regulated products. And legalisation doesn't necessarily need to apply for every illegal drug. Terrorists are in it as much for the loot as for the ideology. The Islamic State, or ISIS, could hardly exist, whatever its Islamist fervor, without hard cash from sales of pilfered petroleum, taxes on its subject population and kidnappings for ransom. Likewise ISIS- and al-Qaida-linked groups in Africa prosper by trafficking drugs across the Sahara and by offering "protection" to smugglers who have long been trading illicit goods throughout the continent. Although Westerners tend to think of these groups as driven by ideology, new recruits may be more attracted by opportunities to make money. Terror is big business, especially in the weak and fragile parts of the world. Five thousand people on Newstart or Youth Allowance may be targeted for a drug test trial. The Australian government's proposed random drug test trial for welfare recipients is not so random. Announced as part of the 2017 federal budget, Treasurer Scott Morrison wants 5,000 people on Newstart or Youth Allowance in three locations to undergo random drug testing from January next year. Traces of drugs including ecstasy, marijuana and ice will be sought using saliva, hair follicles and urine samples. If drugs are detected, the user could find their welfare quarantined. The announcement this week of the largest seizure of "Ice" in Australian history has been accompanied by a familiar chorus of uncritical and often sensationalised media reporting. 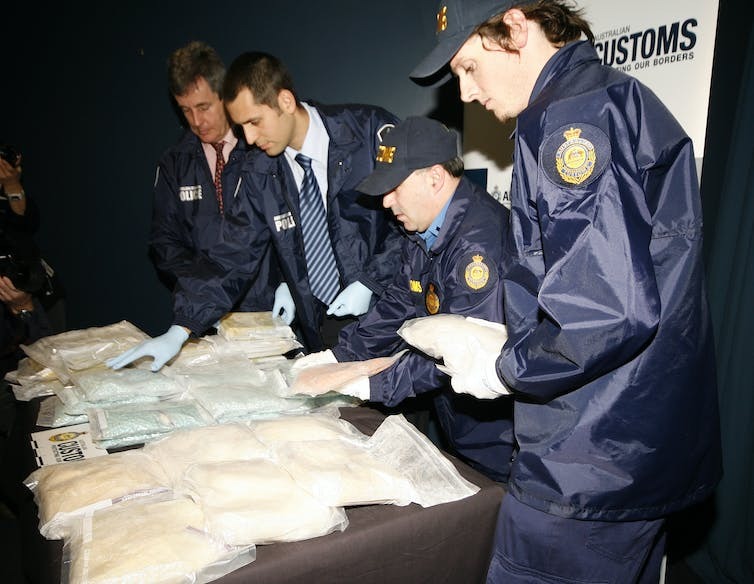 The "street value" of the 903 kilograms of the seized drug was estimated at nearly A$900 million. But are the claims government authorities make about drug seizures accurate? And what broader implications do large-scale seizures have for Australia's drug-control policies? Why is it still so hard for patients to get medicinal cannabis? This week the federal government granted its first license for an Australian company to grow and harvest medical marijuana. This follows Australia's amending of the Narcotic Drugs Act 1967 to legalise the production and use of cannabis for medicinal purposes. The amendment came in February 2016, a year after the death of campaigner Daniel Haslam. Daniel suffered distressing side effects of chemotherapy, some of which were ameliorated by cannabis. While these changes sound promising for sufferers like Daniel, if he were alive today, he would still not be able to lawfully obtain medicinal cannabis. Despite the media attention, extensive political and medical commentary on the subject, and the fact that more than two thirds of Australians have supported medicinal cannabis for many years, a patient with a clear cut and widely accepted case for being able to use lawful medicinal cannabis would still be unable to.